When “Summer” begins, Rory is back in Stars Hollow—well, according to everyone but Rory. She keeps insisting that she’s just back temporarily, but the townspeople know the score: they’ve seen the “Thirtysomething Gang”—hey, Ginny!—and they know how many people go through what Rory is going through. Rory is not special for experiencing turmoil at this point in her life, unsure of what to do next—however, like so many, she believes herself to be special, and believes there is something deeper for her out there. “Summer,” the second-consecutive episode written and directed by Daniel Palladino, tests this belief. Rory throws herself into editing the Stars Hollow Gazette as a way to keep herself busy, but it’s never realistically presented as a long-term option. At no point does Rory imagine herself staying in Stars Hollow, even if her presence lets the show settle into traditional rhythms—Rory and Lorelai discussing the night before over pop tarts, binge-viewing nights on the couch, etc.—in ways that the previous episodes hadn’t necessarily had time for as she flew back and forth to London. Rory was just floating along waiting for someone to push her in a direction, and she gets that through Jess, who drops by the Gazette with a convenient message of belief in her abilities and a plan for the future: what if Rory wrote her own story? I was a bit surprised to see the show go in this direction: it makes logical enough sense (I imagine this is something that Amy had always planned for the show), but it runs the risk of getting too meta, the show self-mythologizing within the text in ways that could become cloying. And while the jury is still out on how this plays, for the most part here it’s simply a way to expand the emotional range of A Year In The Life, and test the relationship between Rory and Lorelai. For the most part, Lorelai has just done her best to support Rory through this “rough patch,” but that starts to fall apart here: when they fight in the cemetery after Lorelai refuses to let Rory write a book about her, Lorelai isn’t just reacting to that. She’s throwing Logan at her daughter, and she’s calling her “kid,” and she’s channeling all of the other unspoken frustrations that she’s feeling. Rory later tells Lane that “she looked at me the way she looks at Grandma,” and while that terrifies Rory it also makes a lot of sense. These women are all Gilmores, and their pride is both fierce and vulnerable, and it was productive to see Rory and Lorelai fight as actual, real-life adults. The same goes for Luke and Lorelai, although in this case the dominoes were already set up: months may have passed since they chose to lie about their whereabouts on that Tuesday morning in “Spring,” but it bubbles over here as their fight turns into a bigger question about the life they lead. Gilmore Girls has never been one to shy away from a fight scene, and this one weaves in and out of the diner’s furnishings as they eventually boil it down to the fact that neither believes they are in control of their life. Lorelai thinks that the wall between them—see: Luke refusing to accept financial help with April—is his way of asserting his independence; Luke, meanwhile, thinks the wall is something Lorelai erected to keep him separated from her family, and her from his. It’s an interesting fight to watch as a viewer because, unlike other fights in the show’s past, I don’t necessarily know if we have the information necessary to decide who’s right. We didn’t see the wall be erected: it happened in the months and years after the end of the series, and so we don’t really understand why it happened, or when it happened. This fight, and really Rory and Lorelai’s fight as well, is not about who is right or wrong: it’s about why each person feels wronged, and how they assert their own identity in the midst of complex, decades-long relationships. 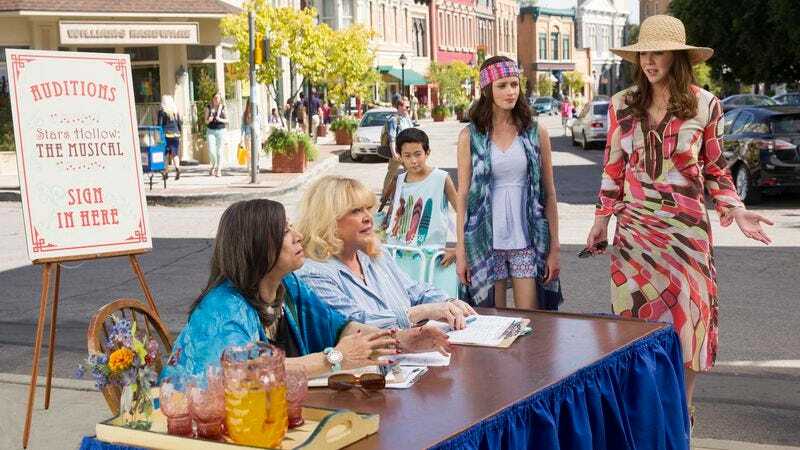 As with “Spring,” Daniel’s love of the zany manifests here, whether in an “even weirder than we remembered” April Nardini or in the insanity that is Stars Hollow: The Musical. But if these middle episodes were meant to be a transition, then Daniel’s indulgence has to make the same turn, and we see it as Sutton Foster’s Violet delivers a heartbreaking final number that not-so-subtly echoes Lorelai’s own life. But what the scene lacks in subtlety it makes up in resonance, as the spotlights moves to Lorelai as she prepares to take a journey of self-discovery “because it’s never or now.” It’s a turn the episode earns, and one that reinforces that this revival exists not just to revisit this world, but also to give these characters the resolution—whatever that may mean—that the series’ creator always intended. In “Fall,” we’ll see just what Amy had in mind all those years ago. If Daniel thinks that giving me actual Carole King will make up for the absence of “Where You Lead,” he is wrong. Stars Hollow: The Musical ran a little bit long for me—and to think we only saw one of the nine ABBA songs—but Sutton Foster and Christian Borle were so beautifully committed, and Jeanine Tesori—who Amy and Daniel worked with on Violet on Broadway, which starred Foster, who here plays a character named Violet—wrote the show a legitimate little piece of musical comedy, complete with an Hamilton homage. I laughed. I cried. Three-and-a-half Stars. Babette would be a regular Gene Shalit. Apologies if you hadn’t been expecting Emily and Ray Wise’s Jack to start a whole thing back in “Winter” until I mentioned the possibility, but I mean—I know a Chekhov’s Ray Wise when I see one. I appreciated the follow-through on the “Secret Bar” reference in “Spring,” as Michel breaks the news to Lorelai that he’s leaving the Dragonfly there—Yanic Truesdale has talked about the unlikelihood of Michel wanting to stay in somewhere so small, and it feels like a fitting bit of self-actualization for the character. I could have maybe taken the child labor situation with Rory and Lorelai at the pool on its own, but the bodyshaming was a whole other shade of unlikeable, and I did not care for it. It’s striking to me to see Emily keep a maid for so long, as Berta and her family keep getting more and more integrated into the household—it’s been a nice gradual development, although some cynical part of me wonders if it’s also taking a note from Netflix about the value of diversity for international appeal (I also presume that’s where the Narcos joke came from, for the record). I’ve missed getting insight into what niche television Amy and Daniel have been watching: here, I have to think both Les Revenants and Halt And Catch Fire are going to be completely foreign to 95% of those who watch this episode.